I started playing on all the maps 2 years ago to rate all maps. 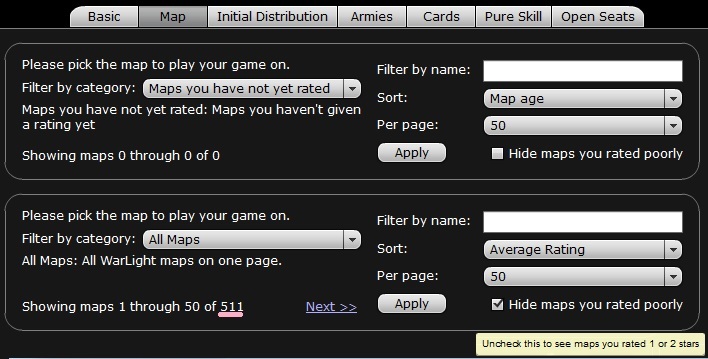 Only 511 maps have a "good" rating became from me. Please rate more maps, it tells the map maker whether he has done a good job ! Good job! But unfortunately I have to inform you, that map ratings are absolutely pointless. I am not sure, but you may be the only person to hold rate 500 maps achievement, correct me if am wrong, so congratulations anyways. I can not imagine anyone to go trough that trouble to get that achievement, knowing its wasted time to rate maps. But I think I would trust your decision because 1/3 of maps are playable at all, and maybe just 1/5 worth playing again. I like your 4/5 and 5/5 examples, proves well enough how quite a many good maps are actually rated under 4 compared to other first page mediocre maps rated over 4. I do not think that Map rating is pointless. I'm working on that aswell btw, I'm at 1127/1836. pointless maybe truly a harsh word for it. But I just see too many mistakes in rating system. Win on 500-maps is something I did not knew about - interesting achievement. Although I like the game a lot I just can´t understand why people pay attention to points, achievements, trophies etc. It just feels so alien to me. Is not the game itself good enough? The concept of achievements/trophies in essence is really interesting, but only to point where you do not know what they are (most of them, some are quite obvious and seen on profile page). It is much more interesting to get them out of random, playing your games to your liking and be surprised by them - not that they would meaning something special. But playing for the sake of some random virtual figure, I just don´t get it - whats the point? I know its a little far-fetched, but it pegs for the question if one loses interest in the game if he runs out achievements to earn? It would be interesting to see each players ratings to maps. First of all it would create a whole lot of drama over ratings in forum and secondly would reveal persons who deliberately deflate other maps ratings. Wait, how do you rate maps again? 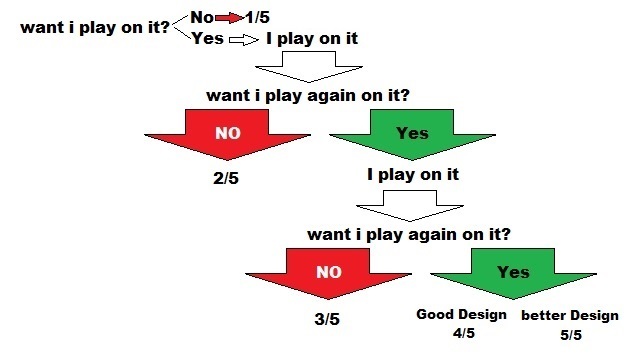 Rating maps is very important--it encourages the mapmaker to either continue what they're doing, or get better. Then you can rate the map "Lower-Saxony big"